Our West Hollywood dentist, Dr. Ghasri, is proud to offer all of the most advanced cosmetic dentistry services to patients that are looking for a brighter or straighter smile. Included in these treatments is dental bonding, an efficient and non-invasive procedure that allows us to restore the form and function of our patients’ teeth. Here is a look at how our specialist for dental bonding in West Hollywood can transform your smile quickly and for years to come. Dental bonding is a procedure in which our West Hollywood dental bonding specialist will apply a tooth-colored resin to any damaged, cracked, or misaligned teeth. The resin begins as a moldable material that Dr. Ghasri will shape to match the overall appearance of your smile. We then use a special light to harden the material that will allow it to last for years to come. Patients should consider our specialist for dental bonding in West Hollywood if they would like to improve the appearance of their teeth after damage or decay. It is often a great solution to fill in gaps, make teeth look longer, reshape teeth, repair chips, or improve the appearance of discoloration. Those that are suffering from tooth decay may also benefit from this treatment. Once our West Hollywood dental bonding specialist has applied and hardened the resin, patients can then care for their teeth with basic oral hygiene habits. This includes brushing, flossing, and using mouth wash multiple times a day as well as making regular appointments for dental checkups. There are a few habits that patients should avoid in order to protect their dental bondings. This includes chewing on any hard materials such as ice, fingernails, or pens. While the resins are extremely sturdy, they may chip or crack when excessive pressure is applied to them. 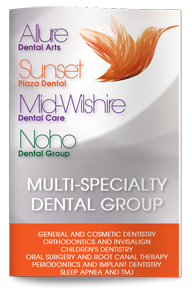 Our West Hollywood dentist is also proud to offer patients a full line of other cosmetic and general dentistry services. Dr. Ghasri has studied restorative and cosmetic techniques extensively to provide patients with the smile of their dreams. If you would like to straighten, brighten, or improve your smile, give Sunset Plaza Dental a call today.